The term bailout probably comes from the act of paying the bail for someone, i.e. bailing them out. Here, someone would pay the bail for someone who is arrested and waiting for trial. The person putting up the bail basically provides the money for the bail and guarantees that the person will not run but rather appear at the trail. Similarly, bailout refers to the act of helping someone out from who is in a tough situation. It usually refers to providing money. Hence, it can be said that a bailout is a financial rescue. A bailout is money provided to a person who is having financial problems. However, the bailout need not necessarily mean money. For example: I am stuck in this horrible meeting, please bail me out. 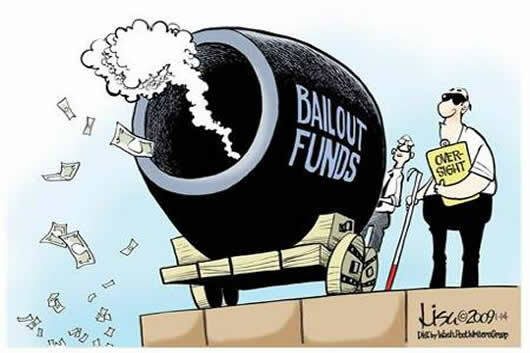 The term bailout is often used to refer to an instance when the government gives money to a back or an organization when they are in financial difficulty or facing bankruptcy. For example: the US government bailout of General Motors and Chrysler. Additionally, the term bailout also refers to a situation when a person quits something. For example: this class is too hard, I’m bailing out. Or I’ll have to bail out of the party, got some work. In each instance, the person is leaving something. He is getting out of the class, and getting out of attending the party because he cannot make it.